The School of Journalism is a unique collaboration between News Associates and Marjon University. Each year we will offer a select group of students the chance to study in our London or Manchester campus and join the most innovative and practical BA (Hons) Journalism degree in the UK. This is the only UK journalism degree programme designed and delivered by a news organisation, so don’t expect 12 hours a week contact learning. You will become a journalist from day one: you will write, produce and edit stories straight away. To help you get started, you will receive a free journalism toolkit. The kit includes an iPad, multimedia apps to help you with the course, dictaphone and a valuable national press card. The perfect tools to support you throughout your studies. 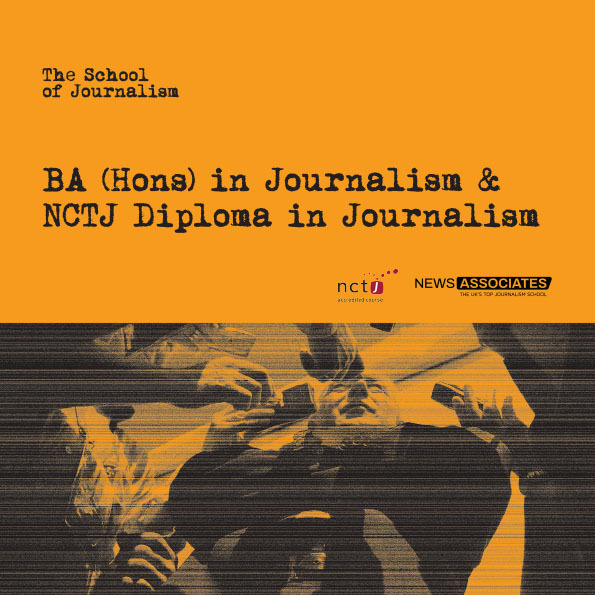 The School of Journalism and the NCTJ: All News Associates courses are accredited by the National Council for the Training of Journalists (NCTJ) and recognised as the best in the country. In 2016, the top courses in the UK were all taught by News Associates – eclipsing those taught at universities. And in 2018, we’re still the best – read more. The School of Journalism will make sure you leave with an impressive academic record. But more importantly you will be an all-round journalist armed with all the essential practical skills and necessary industry qualifications to walk straight into a journalism job. Whether you want to become a photojournalist, sports journalist, fashion reporter, news reporter or travel writer, this course will ensure you are ready to kick-start your journalism career. To find out more about The School of Journalism and its BA (Hons) Journalism degree, visit our course content section. If you want to get a taster for the industry and find out if journalism is for you, why not sign up to one of our free journalism masterclasses? To download our September 2018 course prospectus click on the image above or email training@newsassociates.co.uk to request a hard copy.